Training & planning diary – 6 weeks to go. Now we are on the final run up to the big day I thought I would start blogging my weekly training and preparation. This is to show how difficult it can be to fit training in with life and to highlight ways it can be done, and ways it can fail spectacularly. Back at work after the weekend and today I’m feeling particularly tired (nothing to do with having a big Eurovision party on Saturday night, honest!). I leave work and turn left, away from my house, and cycle a loop which take me up a few long steep hills and back home 11 miles later. 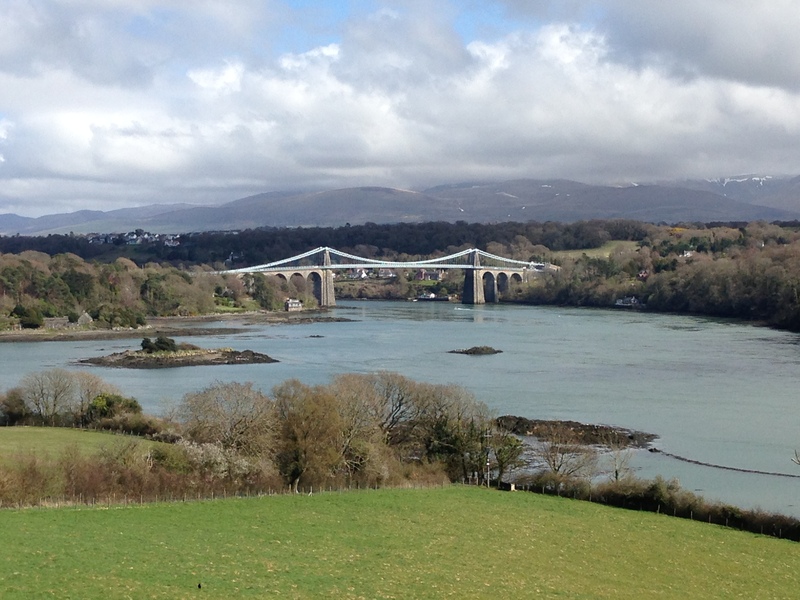 I had great plans to go on a run in Wales before setting off for my interview, or when I got back to Oxford, but in reality I was too nervous beforehand to do anything useful, and too tired after the drive home. Let’s call this a complete rest day. Today I work slightly later then usual, so I spend an hour in the morning doing stretching and weight exercises. I should have done some cycling after work but I always find myself too hungry after getting home at 7 on a Thursday – must do better next week! I leave for work 5 minutes later then usual and make it to the end of the drive before I notice I have a flat tyre. I’m not yet quick enough changing an inner tube in less than 5 minutes so I quickly grab my other bike and set off. As this bike is made of lead (not true) and there was a horrendous gale force wind all day (also not true, but about 15 mph winds) I cycle to and from work standing up most of the way as it’s the only way to get any momentum, this feels like a real strenuous workout and I’m more than a little sweaty after powering up the hill back home. I did manage to find my way and I wasn’t too far off my original course. 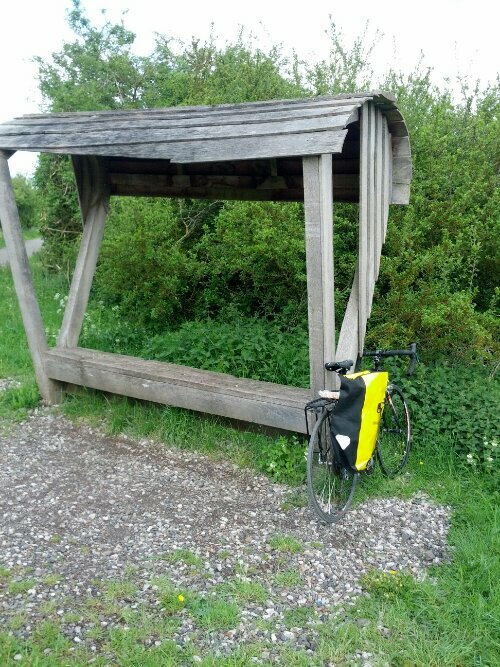 After cycling a trouble free 35 miles down some lovely lanes and cycle paths and up one very steep hill, I turned around and started heading back. Only 10 miles left to go I was already starting to think how I could maybe extend my day and add on a few extra miles, I knew Ryan and Megan were planning on 80 miles as well so maybe I could equal them. Unfortunately my rear tyre had other ideas. I think I probably hadn’t pumped it up hard enough on Friday night, and that combined with a very nasty pot hole meant I had another flat tyre. Not a problem though, I could do this easily in less then 20 minutes. I hoped off the bike, removed the tyre and reached for the spare inner tube I had grabbed from the cupboard that morning. 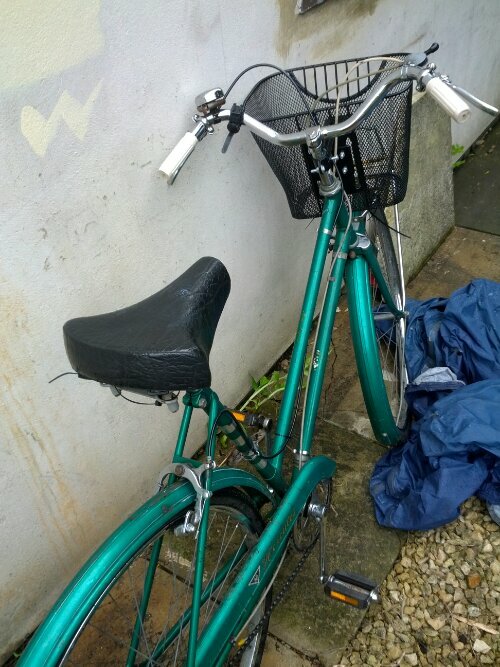 Disaster one, the inner tube was actually for my other bike, a totally different size! Thankfully I had remembered at the last moment to put in the patches that Ryan had given me. I managed to find the two holes and patched them up. Pumping the tyre back up was another story, and another reason why I need to do more weight exercises. I finally got it as hard as I could and set off…. For 1/2 a mile, until it was flat again. This is when I realised a few things, such as how I don’t really know anyone in Oxfordshire with a car who could come and rescue me, and how I was in a village that seemed to have no cash machine or shops (and all I had with me was my usual debit card). I’ve now realised the importance of having some emergency cash and the number of a taxi company! Taking the tyre off again I could find no other holes, but the patches I’d put on before looked a little loose around the edges, I think they must have been quite old and they were letting air through, I had one patch left so I stuck it down as best I could over the edges and once again pumped up the tyre. The ride home was nervewracking and quite exhausting as I was looking carefully at the path in front of me in case any debris caused me further problems. I could almost see my house and knew I only had two miles to go, I was so happy I was going to be able to complete the full 70 miles….and then my tyre was flat again! Having no patches left I walked dejectedly for a few moments before I thought…ah ha! Maybe it’s just got a slow puncture! If I pump it up maybe I’ll make it the final 2 miles! I pumped the tyre back up to capacity (those arm muscles again!) 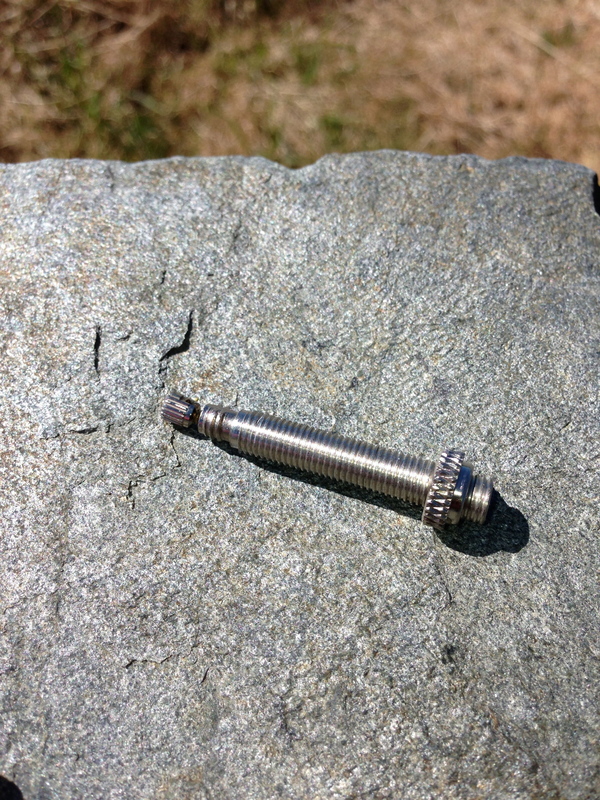 and I set off…for about a minute until the tyre was once again flat. I walked the rest of the way home, depressed at not having made the full 70 miles. Preparation: Saturday evening I purchased a multipack of inner tubes and a pack of self-adhesive patches. Also, the last few days have been great practice for puncture repair training! Because I wasn’t able to cool down and stretch properly after my ride, having to spend 45 minutes walking instead, I woke up on Sunday morning with a lot more aches and pains then I was expecting. Also, from all the stooping over to fix punctures and pump up tyres, my back and arms were in a lot of pain. I had planned to do another long cycle on the morning but my lack of inner tube thwarted me. Instead I did an hour of stretching and gentle back and arm exercises, which certainly made me feel a lot better…then it was off to work for the Sunday shift. It’s difficult trying to fit in really long rides, especially when you have to work 6 days out of 7, so I’m happy I had good weather for Saturday’s ride. I wish I’d managed the full 70 miles but my pace was pretty good so I know I could have managed more in a reasonable time. 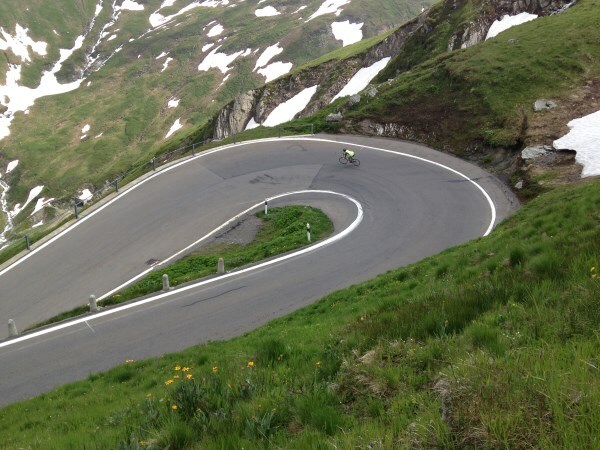 For the next week of training and preparation my goals are: covering more miles after work; at least one indoor “hill climbing” session; looking into purchasing a new helmet; more stretching and strengthening exercises for my back and arms. 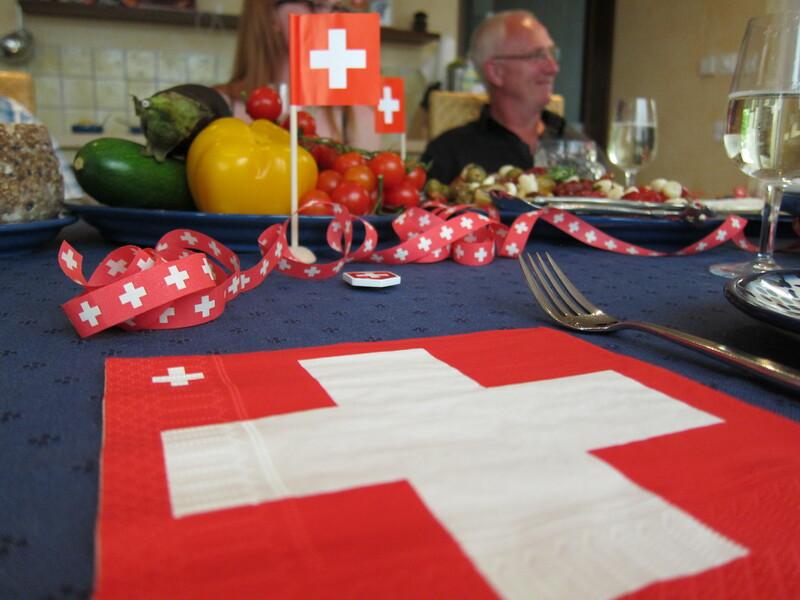 At the end of the next training week I may be doing my furthest distances ever as the whole team gets together for the weekend, so I also need a rest day or two this week…oh, and plenty of pasta eating! I should really have known better than to write a blog post about the perfect conditions and great cycling. If I were superstitious I’d be ranting about karma coming to get me, or something like that. In fairness I’ve been exceptionally lucky with the weather recently. My last post centred around the Welsh micro-summer, and although it was significantly cooler this time round with a chill breeze the sun was still shining and I didn’t feel frostnip setting in! It’s a good job I haven’t been desparate for two days of riding, because (aptly-named) Sundays have been miserable, wet, windy affairs, quickly pushing out all memories of the sun. * The upper limit on the front deraillieur needs adjusting because it sheds the chain when changing to the largest front ring. * The brake pads need replacing on the front. * The headset needs to be replace to stop the excessive play. Of course I got back and got sidetracked, and didn’t touch the bike for the week. The first item is pretty straightforward and isn’t too bad to work around. The other two caused a more substantial issue. When braking, the pads would pulse, binding and releasing a few times a second. This combined with the play in the headset to create a really unnerving situation where the front wheel moved foward and backward a couple of inches as the whole bike shook. Not optimal! A nice semi-coastal circuit… at least to start with. Of course I didn’t realise any of this until after I’d set off. 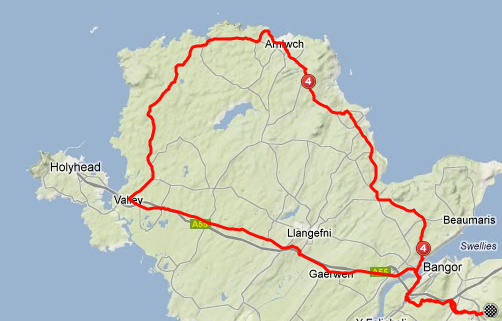 My original plan was to do a full circuit of Anglesey, which would come in at around 110 miles. My first impression of the route is that it’s a lot hillier than I expected, with the road winding towards the coast and then back inland, each time losing and re-gaining height. Not that any of that is a bad thing. The views were generally great, the roads quiet and the going good. There was a pretty consistant headwind which made things feel harder, but my average was still around 15mph. That’s when disaster struck! 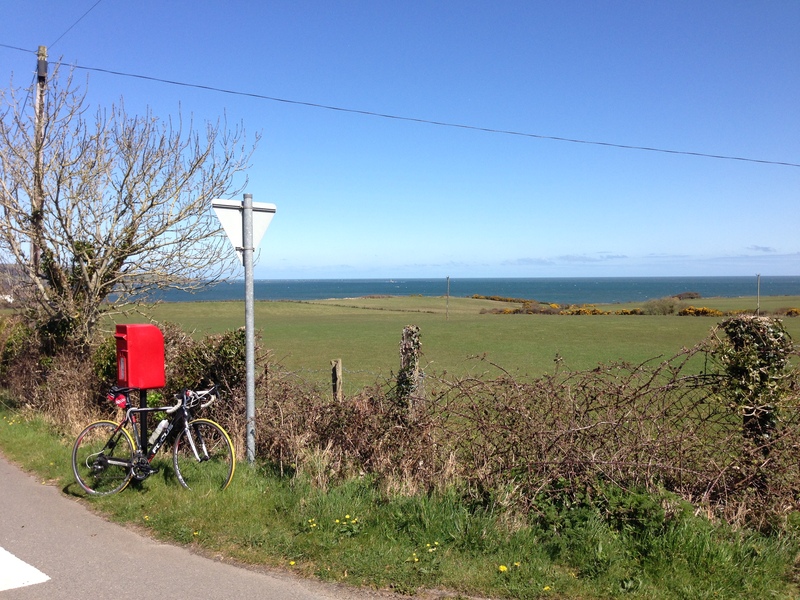 I picked up a puncture on my front wheel near Cemaes Bay (near the top of Anglesey) so pulled over and started the timer. The innertube swap was seamless and I was feeling pretty good as I put the last 15 PSI in when the valve on the tube snapped in half, right through the thread. I’ve never seen that before. I rarely pick up punctures (the last one I had was probably a year ago) so I only carry a single spare inner tube, along with some Park Tool self-adhesive patches in case I get a second puncture. This left my in a bit of a poor state when I couldn’t find the source of the leak in the first tube but had little choice but to put it back in and pump it up. Needless to say I beat a direct route back down the A5 towards home, stopping every five to ten minutes to put some more air in. It was surprising the effect stopping regularly had on me, and the return leg felt many times harder because of it. The trip taught me a little about how I handle adversity, but the big lesson is that there’s more to cycling than just spinning legs. Knowing how to handle breakdowns and improvise is just as important, otherwise you can be stuck miles from home having to give up an call for help! Another thing I noticed was that things felt generally harder because I’d not carbo-loaded the night before. It’s easy to fix that for the next training ride, but it provides some insight into how we’ll be a few days into the trip. Once we’re into the cycle (excuse the pun) of replenishing energy in the evening how easy will it be to take on the extra carbs to be fully stocked for the next day. So now I’m back I’ve stripped down the bike and removed the headset to try to find a replacement, though it’s not as simple as I’d expected. It appears my bike has an obscure set of dimensions which don’t match any standards so after an evening of measuring, Googling, measuring again and scratching my head, I’ve given up and got in touch with Wiggle, who I’m hoping will prove their worth again and get me back on the road. No pressure Wiggle, but it’s the team training weekend coming up, so it needs to be back up and running by Friday evening! In the absence of being able to work on the bike, I’ve been thinking about potential routes for the weekend. The plan is (roughly) to go to Leeds for Saturday and then to return to Wales for Sunday to get around some logistical problems caused by Jen’s car needing some TLC. The day in Snowdonia is easy (and one of my favourite local loops): a 32 mile loop from Bethesda to Llanberis, Capel and home. Saturday is a little trickier as I’ve not lived there for years. Yet again Google Street View will come in handy! Now that we’re into the final countdown (not the kazoo version: http://www.youtube.com/watch?v=X2Btg7lFlig) it’s really pushing me to get my ducks in a row ready for the weekends so I can guarantee a big ride. It’s time to step it up a bit though, so once the bike’s better I need to start evening rides. These are much easier when it’s an extended trip home, so it’s time to get the drybag and rear rack out and start commuting. 15 miles extra a day will definitely help out, and if I managed 350 miles outside in April what will May bring? So today , after cleaning my bike .. Removing all the grit and grime from the gear cassette , and all the rust from the chain I put the wheels back on the frame and I’m met with the sound of gushing water . Reaching the conclusion that there must be water in my tire left over from our bike-swim around the Isle of Wight last weekend, I started to dismantle my wheel. Not only was there a running river in my wheel, but I’ve also noticed that my tire has a puncture in it and a section of it is badly distorted. 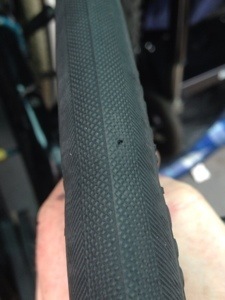 When I got the puncture, riding around Anglesey 2 weeks ago , my tire must’ve taken some damage as well. So a new tire is now on the shopping list. 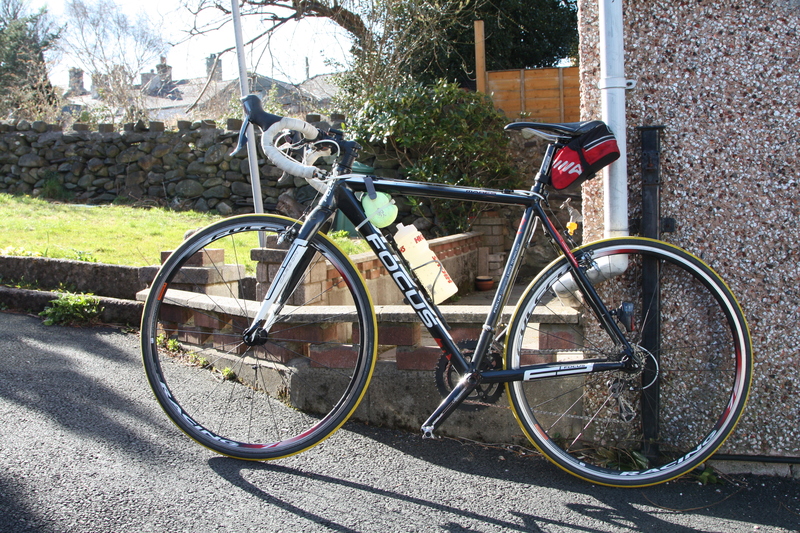 But I’m sure this one will do for now , so i’ll jump on the turbo trainer this afternoon. 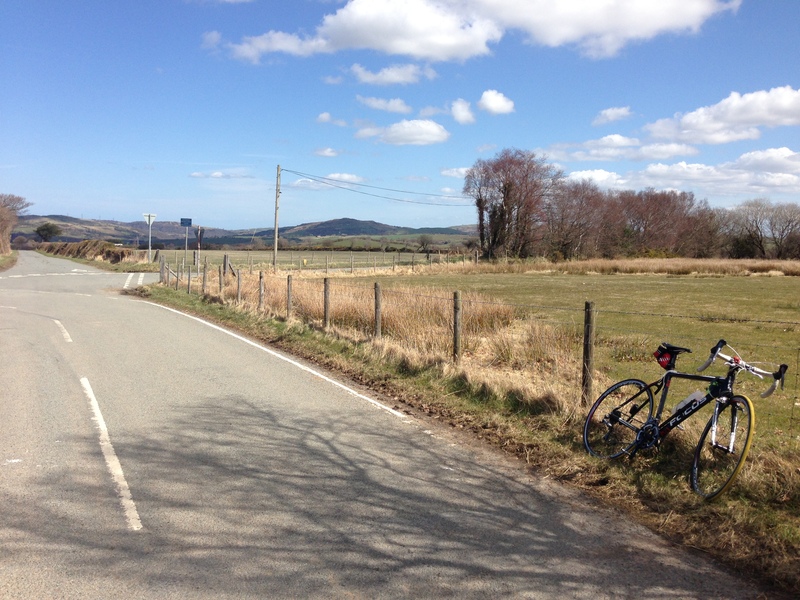 On Saturday I completed my first substantial solo ride of the year: ~90 miles from Bangor to Llanrwst, Denbigh, St Asaph and home. For the first 65 miles I was pondering this blog post and thinking about how I could word a careful apology. After all, we’re going on about training, hardship and challenge. The problem was that nothing really felt like “training”, not for the first two thirds at least. Genevieve, my trusty steed! Cable-tying my jacket above the bottle cage worked pretty well. Sure, I was pushing myself and trying to maintain a reasonable pace. And true, I wasn’t hanging around taking pictures or jumping in icy rivers to cool down, but when you’re cruising along quiet B-roads in the countryside with a perfect blue sky and no wind it doesn’t get much better. It certainly doesn’t feel like training and feels a lot more like a great thing to do on a perfect day. 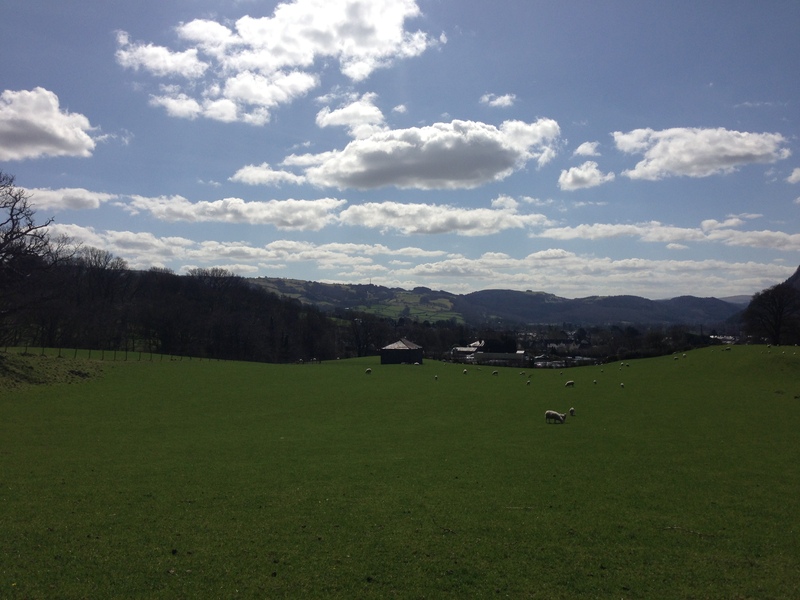 This was my first time riding east of Llanrwst with the exception of the coastal route to Chester, and every hill I crested led to an even more amazing view. The rolling hills strike a marked contrast to the Ogwen valley’s aggressiveness, and I had to make a conscious effort to keep looking at the road and not the countryside. Above Llanrwst towards Llanddoged. It became much hillier after this point. Spring (at least when we get the sunny portions) has got to be my favourite time to ride. There’s so much going on around you as you pass through different areas, and at the moment there’s plenty of young lambs running around, fields being bashed, rolled, ploughed and prepared, building work, and so on to keep you thinking. I planned the route the night before, and came up with a few options, mostly staying within the confines of Snowdonia. This route piqued my interest though because it was predominantly in areas I didn’t know, and calm, sunny days are the best to go exploring. Google Street View is now in my list of indispensable tools for cycling and probably helped me save half an hour over the course of the day by looking at each major turn I needed to make in advance. I didn’t try to commit each one to memory like I did the town names I was passing through, but each time I’d be riding along and think “this looks familiar” before seeing the turn and taking it. No faff, far less map-checking and generally improved enjoyment that comes with the confidence that you’re on the right track. Needing to check the map. This junction beat me and I had to resort to the map. The one big mistake I did make, and am still paying for, was forgetting sun cream. As I pootled down towards Aber I remembered and thought “aah, I’m not going back now, I faffed too much before I set off”. Bad Idea. My arms and legs are still bright red two days on, with razor sharp lines where my jersey, shorts, gloves and socks end. It did make me think about how ridiculous we’re going to look when we arrive in Locarno. Fingerless gloves are going to leave an interesting semi-permanent tan. 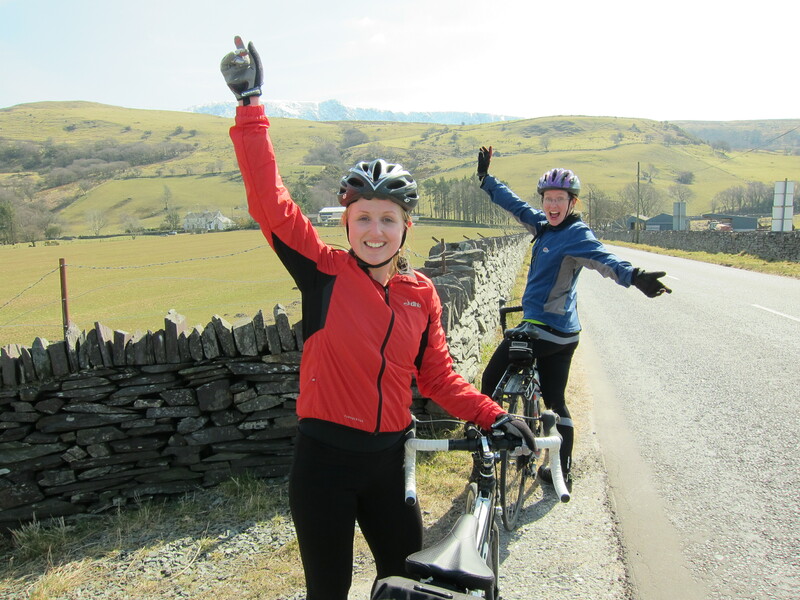 So the questions is: what happened after 66 miles which made it feel like training? The answer is two-fold: Conwy council and a lack of food. The latter wasn’t too serious, but I took half a sandwich too few so spent the last hour feeling like it was harder work than it should have been. Lesson learned. The former was much less pleasant. Whenever I’ve cycled the national cycle route from Bangor to Chester I’ve always headed up through Old Colwyn towards Llysfaen, skipping out the Colywn Bay seafront. This was generally not on purpose. On the way home I thought I’d follow the front, but was quickly disappointed as the cyclepath deteriorated from high-quality smooth tarmac to a broken, rough, uneven path which weaved around lampposts making it clear the cycle lane was an unimportant afterthought. In fairness some sections had good intentions, with one including a cycle lane separated from the road and the pedestrian area with low concrete bollards, but the thin layer of red tarmac that was applied to make the cycle lane obvious has rapidly fallen into disrepair, and was so juddery I came out the other side with bruised palms and a sore back. 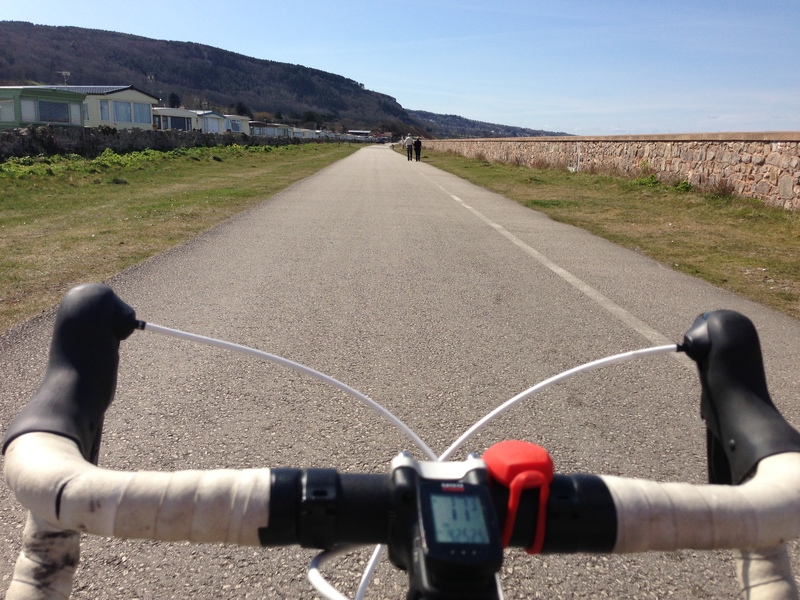 Perfect cycle path at Llanddulas. If only Colwyn Bay was like this! Overall a great day out, and once I’d eaten and recovered definitely felt like another day would be feasible. Of course the “Welsh summer” had something to say about it and Sunday morning was a windy rainfest of epic proportions. Fingers’ crossed for another few days like that before we set off! So I could write a bit of a post rehashing the events of last weekend and adding to Jen’s disaster list that I *almost* destroyed my iPhone by putting it in my jacket pocket while it was 1/2 full of water (cheers Isle of Wight Freelander driver who aimed for that puddle! ), but this evening’s sunshine has pushed all thoughts of winter, wind and rain from my mind. 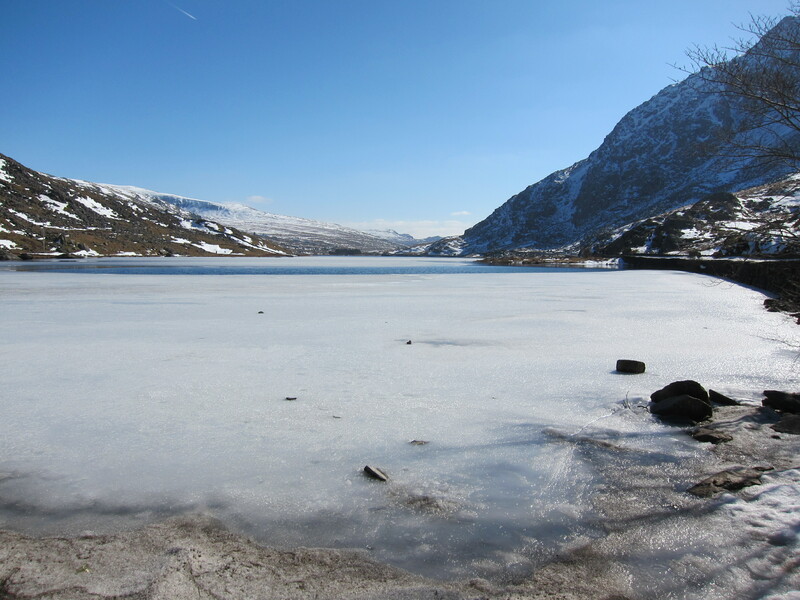 It’s hard to believe that only two weeks ago Llyn Ogwen was frozen and half of Snowdonia was snowbound when I spent this evening on the driveway fitting a new chain and giving the bike a good bit of TLC. The weather looks good for tomorrow, a little cloudy but with almost no wind. Perfect conditions for a long ride down the coast. The first thing to deal with was fitting the new chain. 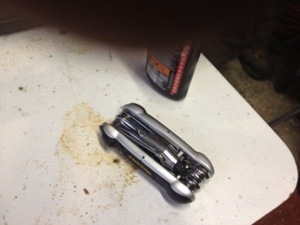 The Shimano chain which came with the bike has seen over 3000 miles and is starting to look a bit worn. 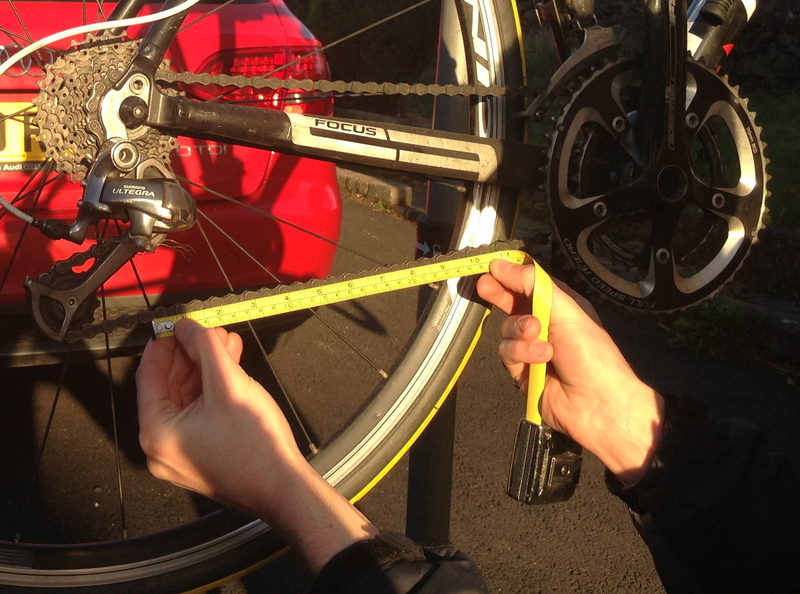 By taking a tape measure and measuring 12″ of chain it’s possible to see roughly how worn the chain is. Measuring from the center of the first pin, as the chain wears the nearest pin to 12″ moves slightly further away. It seems to be generally advised that if it’s over 1/16th of an inch further to the center of the pin it’s time to replace the cassette and the chain. 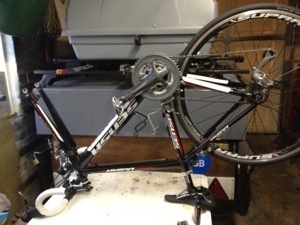 Mine was just under 1/16th, so a new chain should do (phew, those Ultegra cassettes aren’t cheap!). The downside to winter riding is that it takes a toll on your kit. 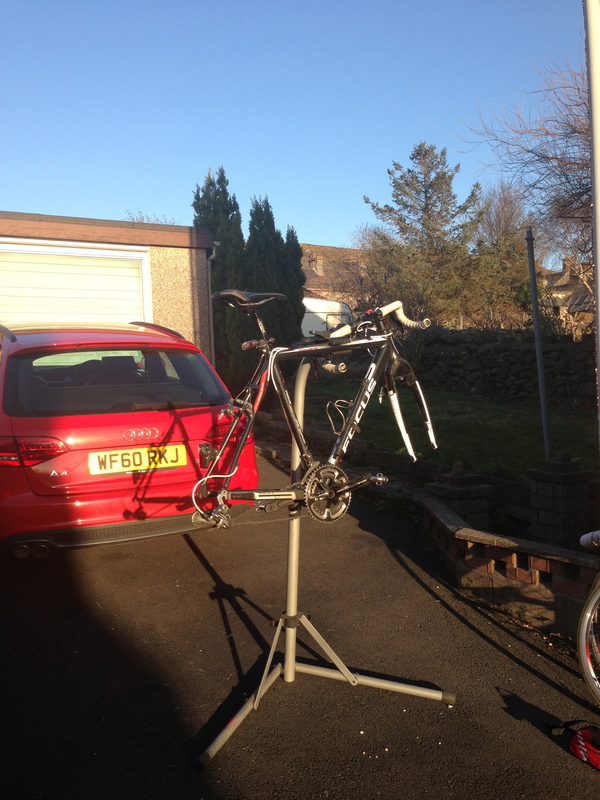 Inspecting the bike after the chain was fitted I noticed that the headset and bottom bracket both need replacing. Definitely a job for another day! Now that summer’s here* I’m feeling much more excited about getting out on the road. Everything’s much more pleasant when you can stop for ice cream every hour! It’s easy to forget how difficult you found the simple things when you first started. Today I taught Megan how to change an inner tube on a road bike. From Megan’s expression you can see it’s not quite as straightforward as I made out, but we got there in the end. One problem I’ve not had to contend with is geting the tyres up to pressure. 100psi is pretty hard work using a track stand, but when you’re as light (and dainty) as Meg, it can become an almost impossible task, requiring unbecoming levels of bounce and grunt. There’s got to be an easier way, and Dad pointed it out, sorting his own flat tyre issue with an electric pump and a smug grin of self-satisfaction. When will we learn? The whole experience was (hopefully) worthwhile, and next time Megan’s sat at the side of the road with a flat tyre it’ll be like a recreation of a Formula 1 pit stop. Unfortunately I didn’t have my bike with me as the forecast was for heavy rain all Sunday. That’s definitely a lesson for me: take the bike wherever you go, there’s always the opportunity for a ride when you least expect it. Instead I’ll have to make do with a turbo-training session tomorrow after work.